Except for an interrupting series of thunderstorms that moved through our area on Tuesday morning, the weather has been warm and sunny. The lakes surfaces temperatures continue to warm and we're looking at a lot of 73 to 74 degree water temperatures in the Itasca region. 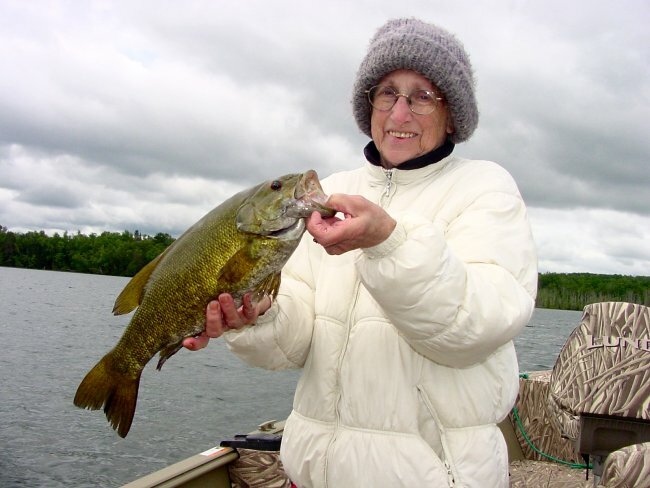 As waters warm, fishing action continues to swing toward the "mixed bag" and Bass and panfish have become more and more active during the daytime. 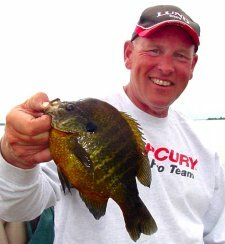 I'm hearing great Bluegill reports from lots of friends who tell me that the smaller lakes are really producing fish right now. These lakes are "turning on" at different times, so if you bomb out on one lake, don't be afraid to jump to another because you may easily discover a dramatic contrast from one to another. I've tried Bluegills a couple of times and so far, my old trick of vertical jigging on the interior edges of the weed line hasn't worked well for me yet. For right now, it looks like the best presentation is a small lead head, ice fly or teardrop type jig tipped with a small cut piece of worm or wax worm and suspended by a slip bobber. The fish don't want to see much movement, so anchoring the boat has worked better than passing through with the trolling motor. After several attempts, we finally managed to boat a Musky and see a few more this week, so it looks like the warmer water temperatures are helping with the Muskies as well. Usually we fish with larger baits, but thanks to a suggestion from a friend, we scaled down to using the smaller Mepp's Musky Killer and that smaller size bait worked better than the larger baits. After a long period of of hearing gloom and doom from friends, we're finally hearing about a few fish being caught on several area lakes, so maybe we're heading for some decent action in August. A good second choice for us has been the spinnerbait style bucktails like the M & G. We've had some fish looking at these as well as two "strikes" this past week. 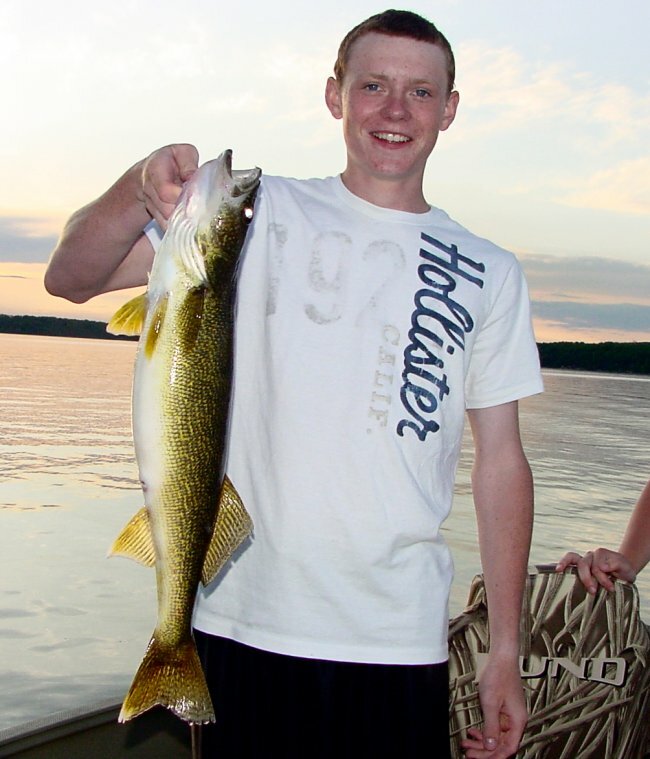 Walleye fishing continues to be "above average" for this period of the summer. Typically we have to have to poke around for a few fish on every spot. But by using this "cherry picking" method, we are catching quite a few fish. Thanks to a couple of really strong year classes, there are tons of small fish keeping us entertained as we look for 'keepers". Presentations vary wildly right now and we've caught some fish on almost everything you can think of. There are still fish out on deep structure so the live bait rigs with Leeches and Night Crawlers are performing. There are a steadily increasing number of shallow locations beginning to work right now too and for me, this seems to be the better action right now. There have been a few fish hitting leeches and even a few hitting smaller crankbaits. But on these weed edges, we've had better fishing using night crawlers. Our best depths have varied from lake to lake, but generally we've found fish in 8 to 12 feet of water. With the weedlines developing nicely, the largemouth are establishing deeper water haunts on the outer edges of deep weeds. As you'd expect by now, Bass are schooling up on the points and inside pockets of these weed edges. We caught an awful lot of Bass on Leeches and night crawlers as we pursued Walleyes earlier this week and so even though I haven't been "Bass Fishing", I feel like we've been doing it. I think this would be a great time to head out for the traditional mid summer plastic worm bite. Northern Pike fishing has been sluggish and fish of small to medium size have been available, but medium to large Pike have been elusive. Late last week we trolled some deeper water with larger crankbaits and lead-core line and did manage to catch a few pike. But. so far I haven't seen anything to get to worked up about. I'm hoping to get a chance to chase some better Northern's during the next several days and maybe I'll have a better report next week. Finally, if you like PERCH, better times have arrived! These fish have caused me trouble all summer long, but we're finally starting to see them on some of the deeper, main lake bars and humps, in the weed beds and on the rocks. So far for me, the best quality fish have come from the deeper (20 to 30 feet) water. Jig and minnow has been about the best bet. One caveat, you need to be sure that you have located a good school of fish before you start fishing! 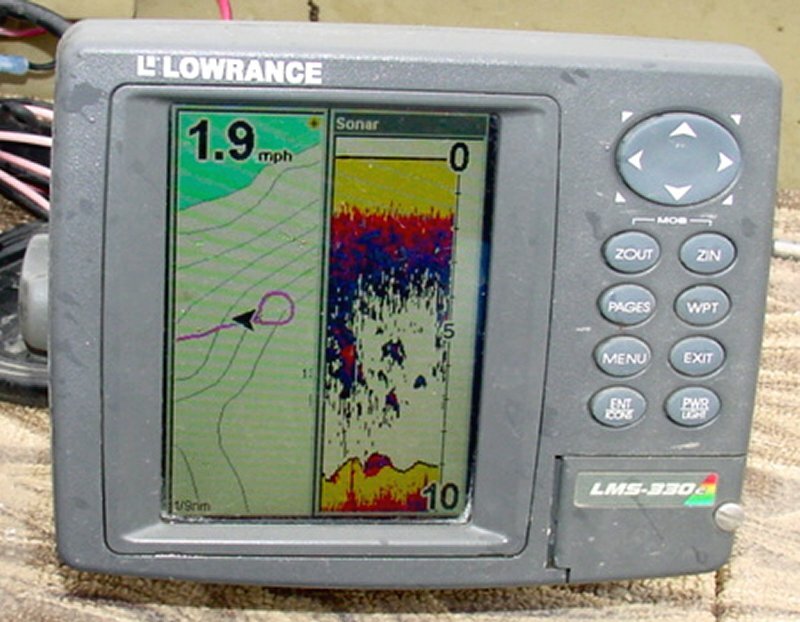 If there are a lot of fish on these deeper spots, you will see them on your graph. If you're only seeing a few fish, or if the fish you see appear to be scattered along a breakline, don't bother fishing that spot. Do a little extra searching up front and you'll be happy that you did. Be sure to listen or go to KAXE 91.7 FM Grand Rapids Radio on Thursdays at 6:20 AM. We usually try to expand on this report. If you miss the show, you can pick it up on the website. Check back for a weekly fishing update (usually on Wednesdays). Things are hectic right now so I'm struggling to keep the reports updated, don't be shy though. Ask a question if you need to and I'll get back to you ASAP. Walleye schools are building up in the weeds. This 28 incher was caught on a main lake hump with a nice weedline in about 12 feet of water. Largemouth Bass are using the same structures, so action may be mixed. Click on this picture for a closer look. When you see Walleye suspended high above the bottom in shallow water like this, try running a couple of crankbaits through them. We've had some success with Salmo's #5 hornets this week and it looks like we might be headed for some good times in the next few weeks. Reports of good Bluegill action have been floating around all week long. We've had a few hours to look for them too. So far, our better presentation has been small jigs and slip bobbers set to fish near the bottom. The weather has stabilized, the insect hatches are running their course and the fishing has settled back into a more predictable pattern for mid-summer. Surface water temperatures are consistently in the 71 to 73 degree range on almost every lake in the Grand Rapids, Deer River area and the "warm water fish" are starting to respond. Panfish are still most active in the evenings, but we're catching more of them during the day. It's common to hook an accidental bluegill as we fish live bait rigs for Walleyes and this is usually a sign that the "day bite" is going to be starting soon. Perch are starting to show up more regularly too. So far, we're not seeing huge schools of them, but again it's common to catch several nice size Perch as we fish for Walleye. In a few cases, we've been able to switch baits to a jig and minnow or spinner and minnow combination and catch enough Perch for a fish fry. 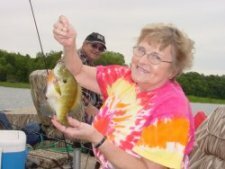 As the water continues to warm and insects continue to disappear from the bars and humps, we'll see these Perch moving toward rocks and that will be a great time to get in on some Jumbo Perch fishing. Weed beds are growing better now and the beginning signs of a good weedline, mixed bag bite are starting to emerge. Bass are still hitting surface baits, spinnerbaits and swimming type baits, but there are small schools forming in the deeper weed lines too. For guys like me who like to fish plastic worms, our time is almost here! 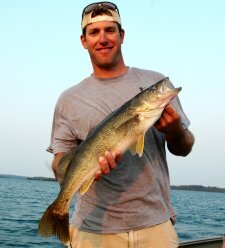 There's going to be a lot of variety in Walleye presentations for me this week. We're still catching quite a few of them on jig and minnow. It's unusual during July, but the cooler water temperatures seem to be extending this jig bite. During the past few days, Leeches have out-performed Night Crawlers but we have still caught several on the worms. On Tuesday, we moved in from the deep water and tried a test run with crankbaits and caught several fish on the weedline using the #5 Salmo Hornets. The fish appear to be building up on the flats adjacent to the weedlines and it looks good for the folks who prefer to troll. We caught a few smaller to medium size pike on these baits as well, but nothing to make me think that there's going to be a hot Pike bite in the shallows in the near future. Water is still really clear for this time of year and it wouldn't surprise me to see the Pike and Muskies stay out in the deeper open water for a long time. As long as the prime baitfish like Tulibee, Suckers and Whitefish remain in the open water, the larger predators will stay out there too. 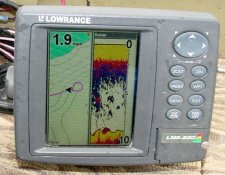 We played around with some lead core line, trolling larger crankbaits on Sunday and we did find some larger Pike and Walleye in the 20 to 25 foot depth range. We've seen an above average number of large fish this month. This 30 incher hit a jig and minnow and she's still in the lake for someone to catch next year. Here's a 26 incher than grabbed a Jumbo Leech on a live bait rig. The Walleyes have been adaptable this summer and we're catching them on a variety of presentations. Trolling large crankbaits using lead core line in 20 to 25 feet of water produced a handful of "above average" fish like this 26 incher this weekend. A turbulent week in Northern Minnesota has kept us on our toes! It had to happen sooner or later and I guess now is the time. 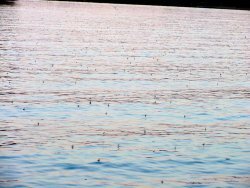 A combination of stormy weather, insect hatches and the arrival of tons of "young of the year" baitfish have definitely made the Walleye fishing more challenging. But we're still experiencing some "highlights" every day and when the conditions swing in our favor, we're still even having some "above average" fishing for mid July. I've spent most of my time this past week on lake Winnie, Cass lake and Cutfoot Sioux. The fishing strategies have been similar on all three, mainly live bait rigging with leeches and night crawlers except for the occasional, individual school of fish that prefer jig and minnow. I believe that it's really important that you learn to be a master at using your electronics, especially during mid summer, because sometimes you need to move from one point to another and "Cherry Pick" a couple of fish at a time until you're satisfied with your catch. There have been several times when we've marked LOTS of fish, but still couldn't get many of them to bite. By moving from one school of fish to the next, you can always get a couple of the most active ones to bite quickly and you're always increasing the odds of finding the one "hot school" of the day. I've noticed this week that the Walleye have preferred spots that have a bit of rock on them. It doesn't have to be much, but a little harder bottom has been a key for me. We fished last week on Cass Lake and did find the perch fairly active on a few spots. 12 to 20 feet of water was the best depth for the breaklines. 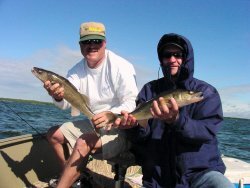 There are some Walleyes on the same breaklines too, lots of small ones this year. 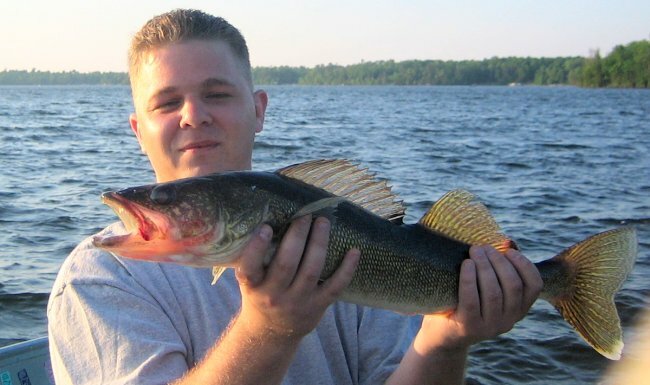 Some better size Walleye were on the humps and smaller bars on the West side of the lake. There are tons of Mayflies and other bugs hatching, so we had to do a lot of searching and stopping for a couple of bites and then move on to new spots. By days end, we had done fairly well, but it wasn't non stop action. Leeches were fairly good on about a six foot leader and Jig and minnow (we had shiners at the time) were the best on the humps on the west side. 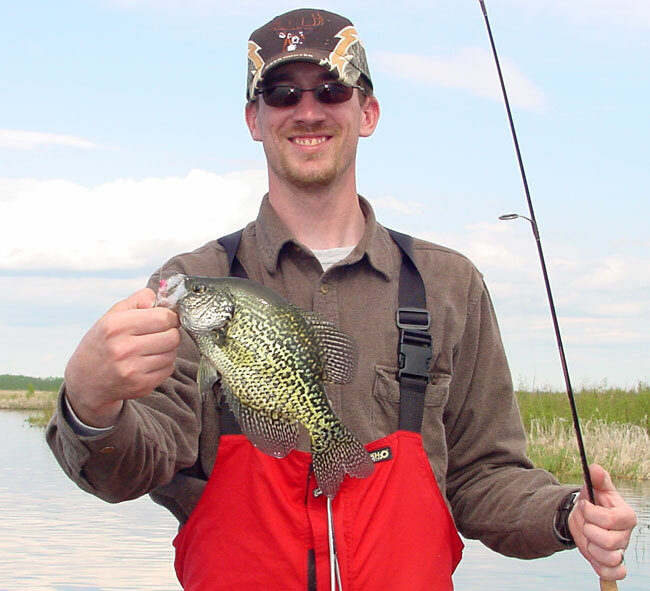 Panfish action has been heating up, especially for folks who fish the evening "mosquito run". Both Crappie and Sunfish are hitting during the evening, but so far mid day fishing has been tough for Crappie. Sunfish are hitting a bit during the daytime and apparently the action is going to improve as the water temps warm up. I've more to add, but I just ran up against the clock and I'll have to try and finish this on Thursday morning. Be sure to listen or go to KAXE 91.7 FM Grand Rapids Radio on Thursdays at 6:20 AM for a weekly fishing update. If you miss the show, you can pick it up on the website. Things are hectic right now so I'm struggling to keep the reports updated, don't be shy though. Ask a question if you need to and I'll get back to you ASAP. Even on a slow day, moving from spot to spot and "cherry picking" the active fish will produce results like this. Sometimes you have to work a little harder, but it does pay off. I just returned from my annual "busman's holiday" up to International Falls and Island View Lodge on Rainy Lake. Over the past eight years, this has become a real favorite time of the year for me because it gives me a little breather and an opportunity to see some new shoreline. As an added bonus, I get to spend a couple of precious days fishing with my own family and friends. This year's trip was really different for me because the cooler, higher water temperatures on Rainy have kept the fish in the shallows more active than usual. So I fished a lot of water where I haven't spent much time in the past. We discovered groups of fish in a variety of locations, but probably the best fishing areas we found were the shoreline breaks and small points around many of the islands. The best bet for me was to locate sand areas along the breakline. Watching the graph, you'll see your "color line" or "gray line" lessen in intensity when you move from rocks to sand. Almost always, we found the better schools of fish on this "rock to sand transition". Even when we marked good schools of fish they didn't always bite, so we had to continually search for new schools and experiment with the baits. There were times when the fish bit best on minnows, sometimes Leeches, sometimes Crawlers and even a few on crankbaits. We literally had one good day using Leeches, another good day using Crawlers and the last day of the trip we had our best success on jig and minnows. Timing was also really important. Maybe one out of three or fours schools of fish were active, so the more we moved around, the more we increased our odds of getting good action. To sum it up, change spots, change baits and change speeds a lot. Sooner or later you'll find an aggressive school of fish. Returning to home water on Saturday, we're finding a similar scenario. So far this week I've had to do a lot of moving and scouting to find the more active Walleyes. The water temperatures have risen into the 72 to 74 degree range and there are insect hatches and young of the year minnows everywhere I look. So the old adage about "finding bait to find the fish" is sort of improbable at this point. Since there's food everywhere, the secret now is to keep finding more schools of fish until you hit the timing right. For the next several weeks, my advice will be to stay on the move and don't fish a spot unless you are marking fish on your electronics. On Tuesday I had my first opportunity to try and catch a Musky, but it wasn't my lucky day. We caught a couple of mid size Pike, but the Musky activity was zero where I fished. We took a break from casting during the mid day and did manage to get in on a mixed bag of Perch and Walleye, so there were some 'highlights" for the day. From here on out, we'll be doing a lot more mixed bag fishing and I'll get some updates added as I get back up to speed. 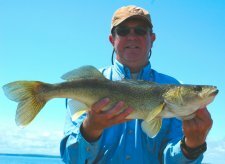 Mid-Summer Walleyes aren't finicky, they're just well fed. Sometimes it boils down to being in the right place at the right time. keep checking spots until you find the one or two hot schools of fish and you're trip will be successful! Insect hatches like these Mayflies don't have to "kill" the action, but they do make your job tougher. It's important to keep moving and checking for schools of active fish. Sooner or later you will land on top of an aggressive school of fish, but you have to keep checking. Fishing Report! 7-1-08 Jeff Sundin - Summer Peak Going Strong! This week I want to welcome a new sponsor. It's not very often that I go into "commercial mode", but sometimes I find something that I really like and take an opportunity to share my good fortune with you. I've been on the lookout for a Loki Landing Net ever since my first one blew out of the boat in a bad storm. I finally had the opportunity to link up with them. Please check out this link to a preview. Another week into the summer and the fishing action shows no sign of slowing down. I was a little worried about a string of thunderstorms the blew through the area on Friday night, but at least for the time being, these storms had little impact on the quality of fishing in the Deer River and Grand Rapids area over the weekend. If anything, it looks like it may have helped me on Saturday (6-28) as it apparently moved a whole load of "pre-spawn" Smallmouth Bass out of the shallow water and on to the first shoreline drop off. Thanks to this little shift of location, we had a great mixed bag of Walleye and Smallmouth. Walleye location has continued to shift toward the deeper water. Shoreline related points that extend well out into deep water, reefs, sunken islands and main lake bars are all good right now. Key water depths for me have been 18 to 24 feet for the most active fish, but at times we are finding schools of fish in the 30 foot depth range as well. The deeper fish seem to be less active, but we've been able to trick some of them into feeding on healthy extra large or jumbo leeches. For me, the Shallower fish seem to be a bit more prone to take night crawlers. I'm not sure what the difference is, but that's been a good rule of thumb for me during the past few days. There are still fish hitting the jig and minnow combinations too, but I've started having enough trouble keeping the minnows fresh that I'm ready to go into rigging mode for a while. I still plan on carrying a few minnows in the boat as a back up plan and when I have problems keeping them alive, I'm putting the dead ones on ice. The ice extends the use of the minnows for at least of full day and I'd suggest freezing some water in a one quart plastic container. Just toss the minnows on top of the ice chunk and you're in business. The Smallmouth Bass I mentioned all appear to have fat bellies full of spawn. I've been concentrating on several of the deeper, clear water lakes that tend to warm up latest, so this would help explain the later spawning activity of the Bass. We had been looking for these fish in shallow water a few days ago and found most of them on rocks in 4 to 8 feet. On Saturday, they were down the edges in 16 to 24 feet mixed with the walleyes and they were very active. We fished with jigs/worms and caught these fish steadily throughout the day. When the weather returns to normal, I'd guess the Smallies will head back up onto those shallower rocks again. When those fish were shallower a few days ago, I had good experiences with the Berkley Gulp Leeches on a 1/8 ounce jig. Bluegill activity in the shallow water spawning areas continues to be good. On Saturday I had to envy a group of fishermen who were anchored within easy sight of where we were Walleye fishing. These guys were hauling in some decent looking sunfish from a shallow patch of mixed weeds and bulrushes. They were fishing with jigs tipped with worms under a small bobber. The action for them appeared to be steady for at least a couple of hours. There are some good Crappie reports floating around too, but I haven't had any first hand experience during the past week. What I've been hearing is that Crappie action has been heating up in the deeper water now. Deeper rocks and deep Cabbage Weeds have been producing for the Crappie anglers and the action has been best during the evening. From past experience, I really like looking for those isolated patches of Cabbage weeds and casting small 1-1/2 inch tube jigs or a similar size plastic beetle body on a 1/16 ounce jig head. This time of year you can get some great mixed bag fishing using this approach. I finally found a replacement for my favorite landing net! Click here to read a review about it. Smallmouth Bass action kept us hopping on Saturday as we fished for Walleye. I had a great experience fishing with Valora Lundberg who fishes like a pro! I have a little extra to say about this trip by clicking here. According to Joe Stevens we "found a good hole" on Lake Winnie. The deep water bite has been picking up steadily over there too, but don't overlook the "weed bite" on breezy days. For a lot of folks, it seemed like summer would never come this year. But we've had quite a turnaround this week. On Monday (6-23) we happened to be fishing on Lake Winnie when the morning surface temperature began at 67 degrees. By day's end the temperature had risen to 74 degrees. There are currently several insect hatches going on at once. Fish Flies and a couple of other insects known to me only as "little green bugs" are crawling all over everything. 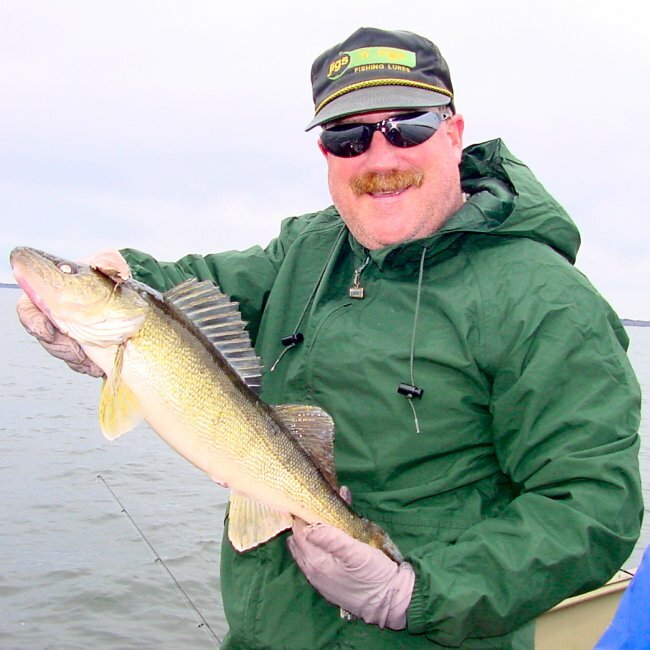 As expected, the Walleye are responding to insect hatches by heading out into open water where the main lake bars, humps and reefs come in contact with softer bottom areas that harbor the insect larvae. We found fish on a variety of structures that included some of the most popular and largest main lake bars. There were also a lot of fish showing up on the small "humps", especially the ones located closest to the shoreline. Walleye anglers were catching fish on a variety of baits including lindy rigs with Leeches or Night Crawlers, jig and minnow combinations and live bait spinners tipped with minnows. For a week or so, you should be able to continue catching fish by jigging on the deeper structures. After that, the fish will get a little more fussy and start looking for the slower, live bait presentations. Lindy rigs with Leeches will be favored by lots of folks in another week or so. The Bass and panfish report is excellent right now thanks to the warming trend. I had a good experience with Bluegills in the shallows this weekend and talked with several friends who have been getting awesome shallow Bass action for both Smallmouth and Largemouth. If you like fishing surface baits, spinnerbaits or jerk worms. This is the time to get out and give it a whirl. I sent one friend out to a good Smallmouth spot and he reported catching about 40 fish in just a few hours. All of the fish are in the shallow areas like Bulrushes, mixed rock/gravel and around any kind of timber you can find. We discovered that a few of the Bluegills are already beginning to move out of the shallows and set up shop on the deeper weed edges. I don't think I'd give up on the shallow water gills just yet, but with all of these insect hatches going on, they too will be attracted to the deeper, soft bottom areas to cash in on the bonanza. Try the shallows first and if that fails, move out to the outer edges of the deeper weeds and try a 1/16 ounce jig tipped with a piece of cut night crawler. For the best results, fish slowly trying to keep your jig almost motionless near the bottom. The really nice sunfish don't need to see much action. The early signs of a Crawfish hatch are showing up now too and that will be good news to folks looking for some more consistent Perch action. The shallow areas with mixed rock, gravel and sand are the first to warm up and the first areas to look for some Jumbos. As the water continues to warm, the mid depth rocks are going to get productive. I'll be spending some time looking for Perch this week and should have a better update for the next report. Walleye remain active in the shallow water. Breezy days still offer good jig and minnow fishing. Shallow weeds, rock bars and primary drop off areas continue to hold fish. Nick Swerlyk had a good week last week. he boated lots of fish including this dandy Walleye. 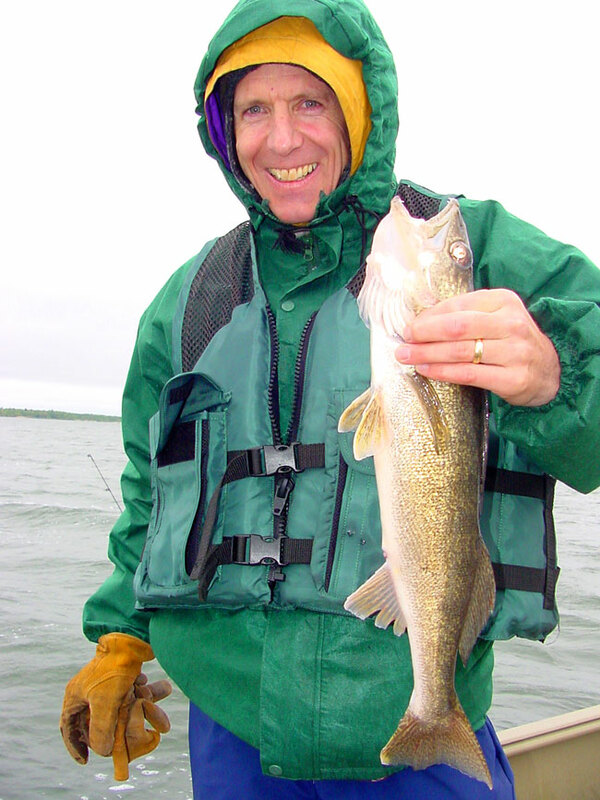 Walleyes are heading out into deeper water water now as the insect hatches heat up. We've had plenty of wind, overcast skies and continuing cool water temperatures during the past week. Surface temperatures on most of the Deer River area lakes are hovering between 61 and 63 degrees and seem to be stabilizing in that range. 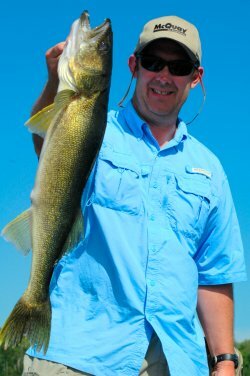 The Walleye fishing continues to be strong in the shallow water on jig and minnow combinations in water ranging from 6 to 12 feet depending on the lake and/or the area you're fishing. There's a change on the horizon though as we've noticed lots of fish with stomachs full of insects instead of minnows. On Monday we moved out into some deeper water and began to locate small, but active schools of Walleye on some of the sunken islands (reefs) located close to shore, but not connected to it. So far these schools of fish are still just fragments of the larger schools we're finding in the shallows, but from past experience, once these fish start to move out to deeper water, the transition will happen fast. With much warmer temperatures predicted for the early part of next week, I'd anticipate a 'mass movement" on at least some of the are lakes, especially the ones with strong Mayfly hatches. 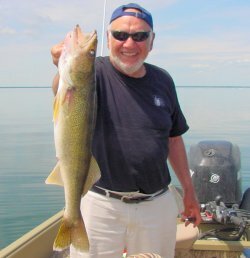 For a short time, the Walleye will continue to hit a jig and minnow, even in the deeper water. But if you prefer live bait rigging with leeches and night crawlers, your time is almost here. On Sunday we tried slip bobbers with leeches, but found only Perch to be interested in them. We switched back to jigging from an anchored position and the action started right back up again. As I spent the last week fishing nothing but Walleye, I'm a little short on the panfish report, but look for an update in the next few days as our warm weather arrives and gets us interested in the Bluegill bite again. You can still view last weeks report for what I had at that time. 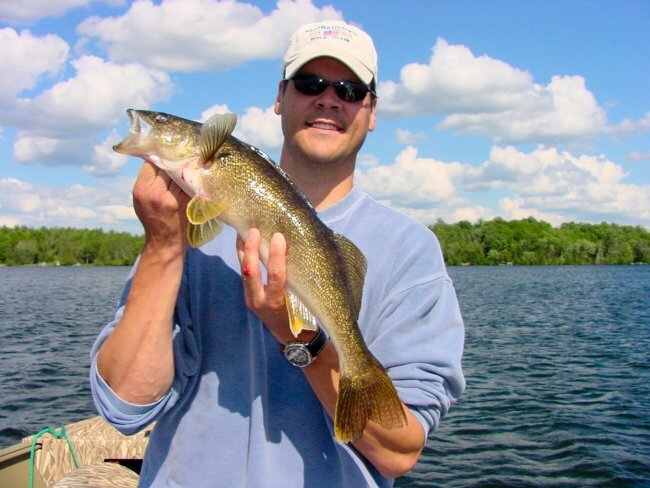 Walleye remain active in the shallow water. Breezy days really perk them up and doubles like these have not been uncommon. 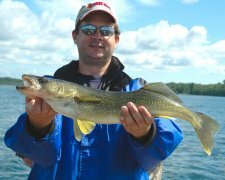 The average size of the Walleye on the slot limit lakes like Leech Lake and Lake Winnie have been outstanding this season. We've caught and released lots of fish in the 19 to 22 inch range and an occasional 24 to 26 inch fish like this one. There are enough eaters out there to make a fish fry, sorting through the 'slot fish" has been a fun process. Fishing Report! 6-9-08 Jeff Sundin - Summer Peak Fishing Approaching Fast! Bluegill and Bass are returning to the shallows with a vengeance as the water temps return to the mid 60 degree range. It's not too hard to locate the fish right now especially if you have a calm morning. We found a great school of Bluegill by moving slowly along the shoreline and looking for visual signs of activity in the shallow (1 to 3 feet) water. Once we spotted an area where fish were surfacing, it was all action. Throw in a 1/16 jig tipped with a cut piece of worm and a bobber set to a foot or so and you're in business. As the day warmed up, the largemouth Bass found their way into the mix and for anyone fishing Bass, it would have been a respectable outing. Typical shallow locations like bulrush patches, wild rice or submerged branches are holding fish right now. 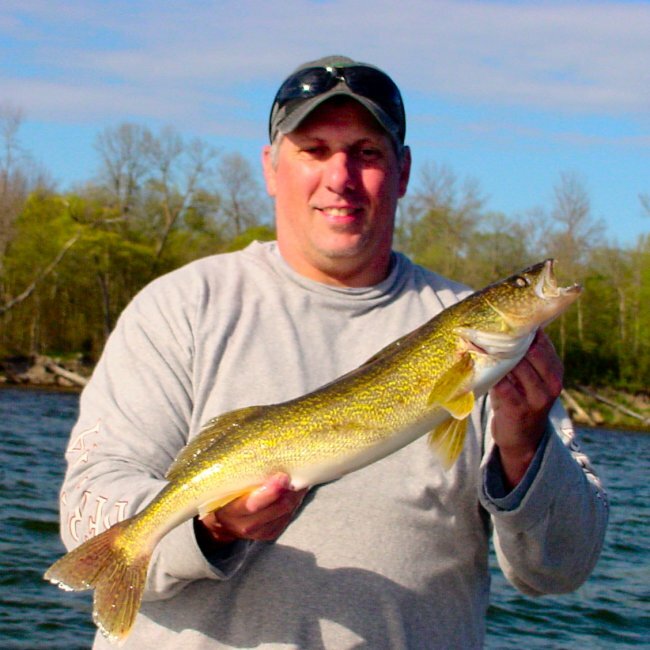 We've seen the fist serious insect hatches beginning now and while the Walleye action in shallow water continues, there are early signs of Walleye moving out to deeper water locations too. As long as we still have mid 60 degree water, there's no big rush to move out to the deep water. But in spite of the fact that water temperatures are staying cool, insect larvae are churning and maturing on soft bottom flats and will soon be a major influence on baitfish and Walleye location. As soon as the water temps reach around 68 or on some of those days that you don't have a decent drifting wind, it's probably a good time to start checking out some of your favorite main lake haunts. My first choices are bars and sunken islands (reefs) that are located close to shore, but lead out into open water. These spots are often the natural runways that Walleye use to travel to and from the deeper main lake structures. These are the type of structures that tend to get "good" before the more isolated bars or humps that exist further out into the lake(s). On smaller lakes, the fish can change locations overnight. So if you were on a good school of fish recently and they're not there on your next visit, check the deeper structure. My Crappie fishing really peaked last week, but we're still able to locate some fairly good schools of fish out on shallow, weedy flats. Cabbage weeds have been a good structure for me in the past few days. We've been fishing small 1/16 ounce jigs tipped with crappie minnows. The weeds are getting thicker now and we've been better off using bobbers set to about 3 feet, maybe a bit deeper if you find a cabbage patch on a deeper flat. Your best bet is to poke around slowly until you get one active fish to bite, then slow down and concentrate on that small area. When the bite slows down, start wandering slowly again until you pick up the next school. Yellow Perch seem to be the hardest fish to stay on top of right now. We've had some decent fishing for them as we fish for Walleye, but I don't think I could get a consistent, repeatable pattern going right now. The fish that we're getting are generally a bit smaller than usual, 8 to 9 inch fish are common, but 10 inch or larger are less plentiful so we've released most of the fish we catch. Jig and minnow or lindy rigs tipped with minnows and fished in areas with mixed weeds and rock have been my best bet. If you've been a fan of Leech Lake in the past but haven't been there in a while, it's time to get out your notebook and bone up on your favorite spots. Thanks to the efforts of the DNR, US Fish and Wildlife and a variety of sporting groups, the Walleye fishing on Leech has really rebounded. A combination of Walleye stocking, slot limits and working to get the Cormorant population under control have helped lead to the comeback. I'll be adding more comments about Leech Lake as time allows, but for now, if you have time to get over there, I don't think you'll be disappointed. Fish are still shoreline related, so you're best bet is the classic jig and minnow combination. We've had consistent action in water depths of 8 to 12 feet and as always on Leech, the windy days are the best. Bluegills are moving into their shallow spawning haunts and the schools of fish are aggressive right now. It's rare for me to get into this shallow spring action, but I had a chance to do it this week and it looks like prime time is here now. The Crappie that were in the shallows last week are moving back out onto the deeper flats near spawning areas. Look for patches of green cabbage weeds and you're likely to find some schools of Crappie. 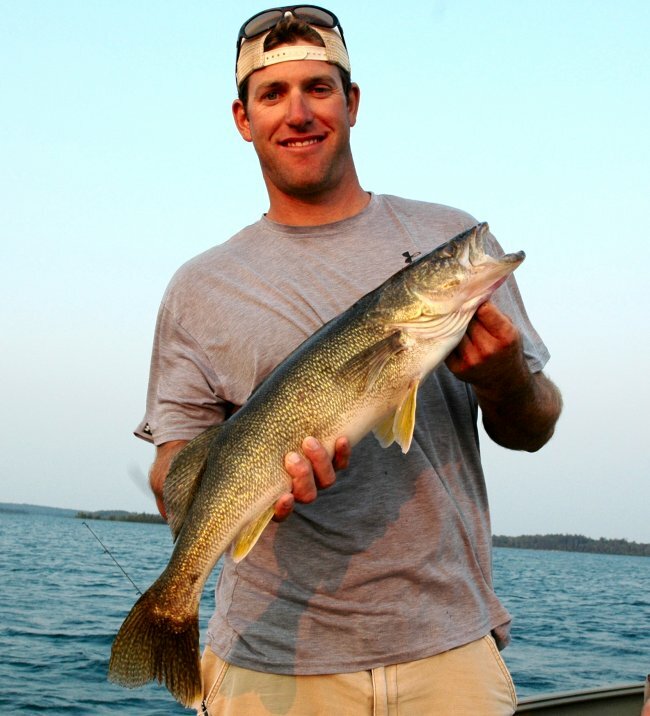 The Leech Lake comeback is great news for us. This is an old time favorite lake and the fishing is starting to remind me of the "good old days". There are a variety of sizes again so you'll have some "slot fish", some little ones and some eaters too. We had a great warm up late last week that pushed the water temps up into the mid 60 degree range on most of the Deer River and Grand Rapids area lakes. 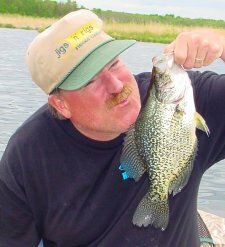 As soon as the water temp hit 65 degrees we saw an immediate upturn in the Crappie action and anglers everywhere within a 50 mile radius began reporting good catches of shallow water, spring Crappies. We had limits every day until Wednesday when the cold front finally chipped away at the shallow water temperatures until they returned to the mid 50's. I'm not sure if I expect to see the Crappies move back into the shallows or not. Typically, once we get the big run, the first cold front that comes along moves them back out and we rarely see a secondary move back into shallow water. If that happens this time, start looking for Crappies in the green cabbage weeds. Anytime you can locate a good Cabbage bed on a flat near a known spawning area, you'll find the Crappies. A great approach is to cast small 1/16 ounce jigs tipped with a 1-1/2 inch plastic tube, Beetle body or even a small 2 inch twister tail. let the jig fall into pockets in the weeds and when you feel a "tick", set the hook immediately. 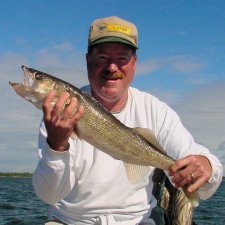 Walleye fishing presentations are still primarily shallow water, jig and minnow offerings especially when you have a good drifting wind to work with. But even though the water temperatures remain cold, I've begun to see small schools of fish 'stacking up" on deeper rock points and some of the sunken islands or reefs located close to the shoreline. A couple of these schools of fish have been failing to respond to the jig and minnow so I've set my sights on leeches and night crawlers to begin working well during the next few days of fishing. At any rate, it's a good idea to start carrying some leeches and crawlers just in case the wind won't blow and you need to start scrounging. If you find one of these schools of fish in a concentrated area like a small reef or point, remember that this is prime time to catch some fish using slip bobbers too. Bluegill reports were okay, but not great last week and I think a lot of these fish were just beginning to move into the shallows before they were interrupted by the cold snap. I'm expecting to see a lot of movement as the water warms back up this week. We searched a lot of shallow water last weekend and saw no real sign of any large scale spawning run, so I think the best is still to come. Perch fishing has been slow this week and they seem to be widely scattered in the shallow water flats as are the Walleye. We've caught a few Perch mixed in with the Walleye, but I have yet to find a really good school of keeper size fish. The weather seems to be playing a role too as the bright conditions and clear water are making the fish unusually spooky. When a find a small group of fish, they bite for minute or two and then quickly disappear. It wouldn't surprise me to see this behavior continue until we get a little "bloom" in the water, but I'll let you know if the action picks up. This weekend is the Musky Fishing Opener and it will be really interesting to see how they respond in the below normal water temperatures. What if there's a "pre-spawn" feeding period associated with the late spawning season? it could be a pretty action packed weekend for Musky anglers if that's the case. We'll see how the reports come in and let you know. Marty Franklin found the Walleye fishing pretty rewarding even if we did have to bundle up a bit. 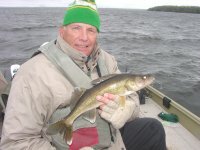 The cold water temperatures have kept a lot of Walleyes in the shallows and so far, the action has held up really well. 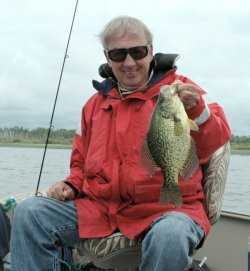 Crappies made a big move last week and anglers all over the area were reporting good catches. The action slowed with the cold front this week. We'll see if they come back in or not, but I expect we'll still be seeing the big Bluegill move this week. A couple of warm sunny days have helped push the water temperatures up into the High 50 degree range on most of the major Walleye fishing lakes in the Deer River and Grand Rapids area. We've concentrated mainly on Lake Winnie, leech Lake and Bowstring this past week and fishing has been consistent. Due to the cold nights we've had, fishing has generally started out slower in the early morning, with action picking up as water warms during the mid day and early evening. 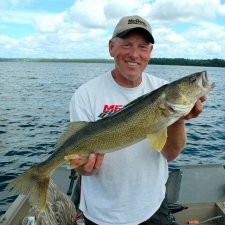 Walleyes have been located on the shallow flats in roughly ten feet of water sometimes shallower, sometimes a bit deeper. When the wind is fairly calm and conditions are bright, the fish seem to be scattered and our best approach has been to cover ground slowly and thoroughly. At times, we've struggled to keep them biting and there have been a lot of light hanging bites. But when the wind picks up and I can drift, the fish have been moving tighter to the shallow drop off in water depths of 7 to 8 feet and fishing tight to the structure becomes more important. 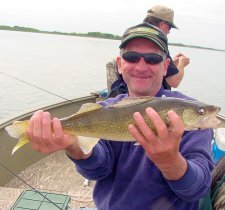 Under breezy conditions the Walleye have fed heavily and we've had some fantastic action this week on this type of day. Walleye fishing presentations are still primarily jig and minnow. During the calm periods, I've been switching back to the 1/16 ounce jigs and trolling very slow keeping my speed at .4 to .5 MPH with the MinnKota. When the wind blows we bump up to an 1/8 ounce jig and try to keep the drift speed under 1 MPH. When it gets really breezy and the speed gets out of control, I start backing into the waves with the outboard and use a large drift bag to help control the speed. We have been lucky to get plenty of minnows at Fred's every morning, so the shiners have been our primary minnow. But honestly, I carry the shiners more for my customers benefit than for the fishing. Lots of folks are convinced that you can't catch a fish without shiners, but I have done equally well with nice Rainbows, Fatheads and even small Sucker minnows. The real key is the quality and size of the minnow. Keep a nice "bright" looking minnow on the hook and you'll be fine. Incidentally, even dead minnows kept on ice can look very nice and work quite well. Crappie reports are starting to trickle in from smaller lakes in the area. We spent a couple of hours checking spots yesterday on Cutfoot Sioux, but with water temps only at 57 degrees, the shallow water wasn't very well populated. Wherever water has reached the low 60 degree range, anglers are finding some active fish moving in to spawn. I'm still the odd man out on Crappies because of the demand for Walleyes during the early season, but hopefully we'll get zeroed in on some fish this week. 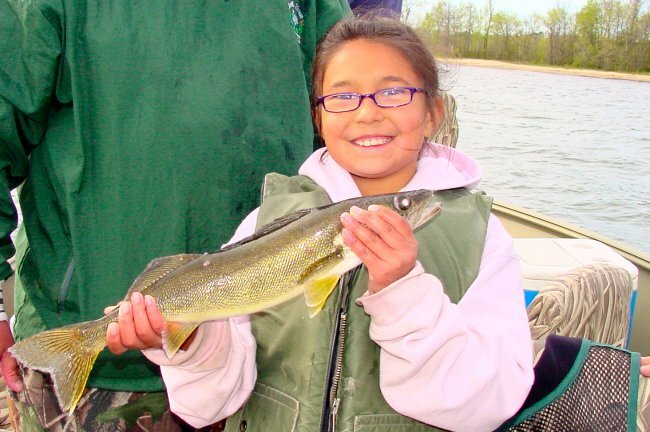 Here's eleven year old, "Gabby" Goettl with a nice 23 inch Walleye. She had a hot hand this week and almost won the prize for big fish until uncle Phil boated a 26 incher in the late afternoon. She still gets the prize for most entertaining angler! 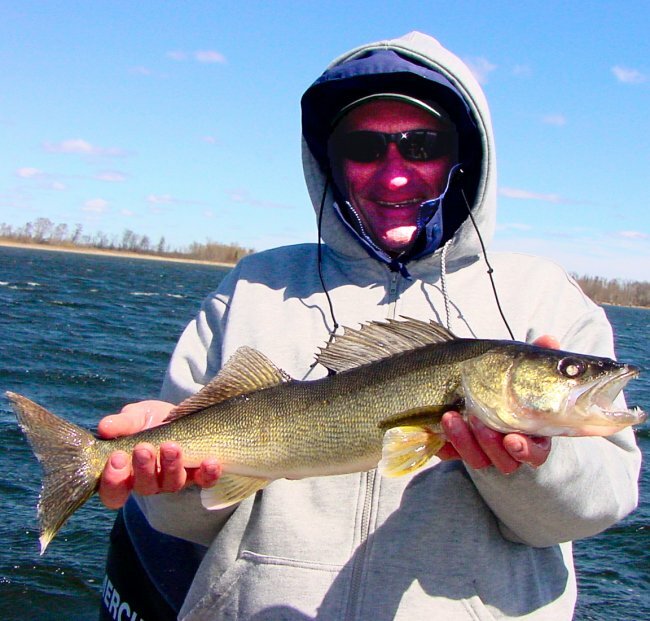 In spite of a week of cold, windy weather, the Walleye continue to cooperate. We've had a couple of calm, sunny days that slowed the fishing a bit, but if we keep our nose to the grindstone, we're still catching plenty of fish. I've spent the past few days fishing on Lake Winnibigosh and even though there are still reports floating around about people catching high percentages of "slot fish", my experience has been the opposite. A good estimate would be that we're catching 3 or 4 "eaters" in the 14 to 15 inch size range for every fish that's in the protected slot of 17 to 26 inches. A good rule of thumb has been to start our mornings in 10 to 12 feet of water and move shallower as the day progresses. In the afternoons I've been holding the boat in about 8 feet and that seems to take care of location for me. I still see lots of people fishing out on flats in 10 to 12 feet and when I watch them, I do see fish coming in. But, I think hugging the breakline is still a bit better. We're using light jigs, my favorite has been a 1/16 ounce "Sneaky Pete" and a close second has been a 1/8 ounce Bug Eye. I'm not sure color has been too critical, but we've been using glow-lime, glow-pink, yellow-lime and yellow-orange combinations. I think it's important to mention that with the 1/16 ounce jigs, 4 pound test line performs a lot better than 6 or 8. So if you're giving the light jigs a whirl, use your ultra light rod and lighter line. The heavier line seems to float the jig too much and if the wind kicks up, you'll lose your contact with the bottom. As much as you hear about Shiners, I have to say that we've had plenty of success using nice Rainbow Chubs too. I really like the Rainbows on the super light jigs because when you lip hook these minnows they stay alive and keep kicking way better than the shiners do. This allows me to fish almost like I'm Lindy Rigging, using very little motion. Just keep wiggling your rod tip and wait for a pick up. Thinks are hectic right now so I'm struggling to keep the reports updated, don't be shy though. Ask a question if you need to and I'll get back to you ASAP. The ice was mostly out for the Minnesota Walleye opener and fishing was good for folks who fished on Lake Winnie where the larger females were the main attraction this weekend. I opened up on a smaller lake, but friends of mine told me stories of boating lots of large fish on both Winnibigosh and Cutfoot. We finally made it over there on Monday where our experience was similar. We caught mostly fish in the protected slot ranging in size from 17 to 20 inches. Not many really big ones (for us) and not many really little ones either. There were some anglers who found schools of smaller fish that were still in "spawning mode" and it was really easy to tell when you caught a male Walleye (if you know what I mean) by their behavior upon entering the boat. As predicted, once you find the males, there is a lot of action because they're feeding fairly heavily, but at the same time, they refuse to leave the shallow gravel areas where the instinct to spawn is still strong. In other words, once you find them you have them pinned down. We've had a bit of a rocky opener in terms of weather. But the fish are here and fairly cooperative. Many of the early season anglers we expect to see this time of year are not here yet. It was almost spooky to land the boat at Plug Hat Point on Lake Winnie this past Monday and find that there were no rigs parked at the landing. I know that it's been cold outside but Holy Mackerel, the fish are cooperating and this is Minnesota. I think it's time to shake out the cobwebs and head out to the lake. The weather is moving a step in the right direction now with temps predicted to be nearly back to "normal" over the next couple of days. I expect that the weekend will be busier with pent up demand from folks who usually make it up for the opener. I'll add an update tomorrow morning after we experience what is predicted to be our first warm sunny day of the 2008 fishing season. Please check back tomorrow. With only 4 days to go until the Walleye Fishing Opener, folks that want to head out on their traditional opening weekend fishing trips are starting to ask whether or not the ice will be out in time. 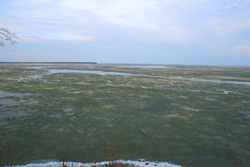 Yes, the ice is going out fast now and there will be places to fish. Many of the smaller lakes are going out fast now and the larger lakes are trying hard to catch up. Even though we won't have 100 percent of the water available, there will be fish to catch on the opener. Some of the well known, "prime spawning areas" like Little Cutfoot Sioux, Boy River and others will have restrictions so be sure to check for closures. I talked with the DNR Area Fisheries Manager, Chris Kavanaugh this morning and they set nets at Little Cutfoot this past Friday. The stripping operation should be all wrapped up in a day or two. The fish captured in their nets were "ripe" and mostly ready to be stripped, so the fish aren't as far behind schedule as we think. In the past, there have been years when they could even get the nets set until after the first week of May. The problem with a late spawning season is that there will be a need to protect some of the spawning fish. 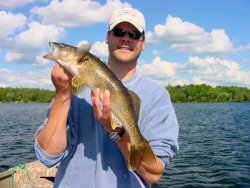 Slot limits take care of that problem on some lakes, but there will be certain instance where anglers are fishing "pre-spawn" Walleye. We'll need to exercise good judgment about releasing those larger females when we stumble into them. The late ice out might cause us to do a few things differently, but it's not a gloom and doom scenario. Some of us have been talking about past seasons where late ice out created the opportunity for some of the best "Pre Spawn" fishing that lots of us had ever experienced. The 1996 fishing opener is remembered by lots of folks as one of the best big fish bites we've ever seen in the Deer River area. 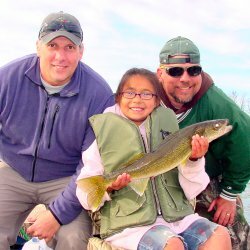 Anglers who head to places like the Rainy River or the Mississippi River at Red Wing during early spring know what the pre spawn season is like and that's why we race to be the first ones out onto open water. It's rare that we get an opportunity to fish pre spawn Walleye on Minnesota lakes because the season is almost always late enough to be assured that these fish are finished spawning. It's beginning to look like we might see the opportunity again this year and I expect to be adding some tips on strategies after we see how the weather breaks this weekend. Here's a look at Lake Winnie as of Tuesday 5-6-08. Black ice breaks up fast so it looks like folks planning to fish Winnibigosh will have at least part of the lake to fish on. Here's a typical view around the Deer River area right now. 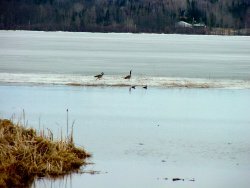 Lakes are still mostly ice covered except for shallows or current areas at inlets. Fishing Links Section. We are happy to exchange links with folks in the fishing industry. Resorts, Tackle Manufacturers, Fishing Boats and Gear, Outdoor Writers and others in the world of fishing are encouraged to network with us. Please click here to request a fishing link exchange.